New comic tells the story of fibromyalgia.The latest Fibromyalgia – ME – Chronic Pain! A series of comics designed to inform the public about common but poorly understood conditions launches this week with the first edition focusing on fibromyalgia. 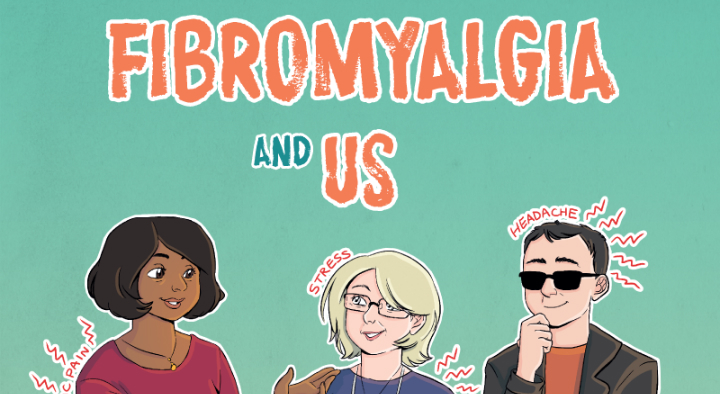 Writers, comic artists and health professionals from the University of Dundee and NHS Tayside will celebrate the publication of ‘Fibromyalgia and Us’ this Friday. The new comic explores the long-term condition which can often cause intense pain and/or fatigue all over the body and the impact it can have on individual patients and their families. Written by those living with this condition, in collaboration with a doctor and physiotherapist from NHS Tayside, the new comic will be launched at the Dundee Comic Creative Space on Friday 1 December. Professor Divya Jindal-Snape, Professor of Education at the University, said, “This comic has been designed with the purpose of raising awareness of fibromyalgia amongst professionals, families, and communities. Those interested are invited to hear more about the project and get creating comics themselves at the Dundee Comics Creative Space, Unit 7 in the Vision Building on Friday 1 December from 6 – 8pm.